Ensuring the availability of CAM medicinal products for the benefit of EU citizens in order to exploit their potential to address some major health issues of our time such as antimicrobial resistance and chronic disease. In several EU Member States the availability of CAM (Complementary and Alternative Medicine) medicinal products – i.e. herbal, homeopathic, and anthroposophic medicines – is unnecessarily restricted. The lack of availability of these products inhibits increasing demand by EU citizens for low risk, health-enhancing CAM medicines, hampering the ability of doctors, veterinarians and practitioners to provide effective CAM treatments. It also undermines the potential benefit of these products in helping to tackle specific health issues prioritised by the Commission e.g. combating anti-microbial resistance, managing non-communicable diseases (NCDs) and sustaining healthy ageing. Herbal, homeopathic and anthroposophic medicinal products currently meet particular difficulties in accessing the European pharmaceutical market. These products are restricted in various ways for both patients and the public. These problems are not new and have been identified repeatedly by the stakeholders concerned. The availability problems of CAM medicinal products were also acknowledged by the Matrix Insight report, an external study commissioned by DG Health and Food Safety for the Pharmaceutical Committee and published on the Committee’s website in November 2014. The report said that further work is ‘expected to inform policy options for the Commission to consider in order to address the issue of unavailability’, and that a need for further action in this area was needed. Such action, the report said, ‘should focus on ensuring that the process of authorisation of herbal, homeopathic and anthroposophic medicinal products is more consistent, both with the text of the existing provisions and between Member States.’ Since then little has changed. 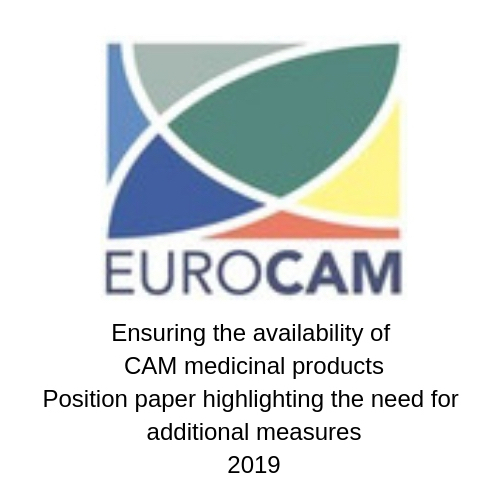 The EUROCAM document describes the needs of patients and health professionals seeking to make use of CAM medicinal products specifically suggesting measures that can improve the availability and use of CAM medicines.